Anne Boleyn was the second wife of King Henry VIII. 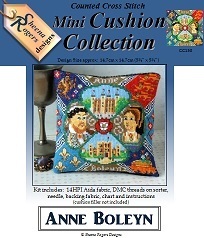 They married officially on the 25th of Janury 1533, and this cross stitch design features motifs relating to their lives. Anne's childhood home of Hever Castle features in the bottom section of the design, with the Tower of London in the top section. The corners show sections of Anne's Coat of Arms and Sigil, including a Falcon and rose-covered tree stump. The pale yellow and blue border patterns were inspired by those found on the memorial tile for Anne Boleyn which is in the Chapel of St Peter ad Vincula, Tower of London. Only whole cross stitch is required to stitch the design with a fair amount of backstitch needed for the finer details.